When it comes to weddings, there’s no denying that the most fashionable of nuptials are the most fun to gawp at. 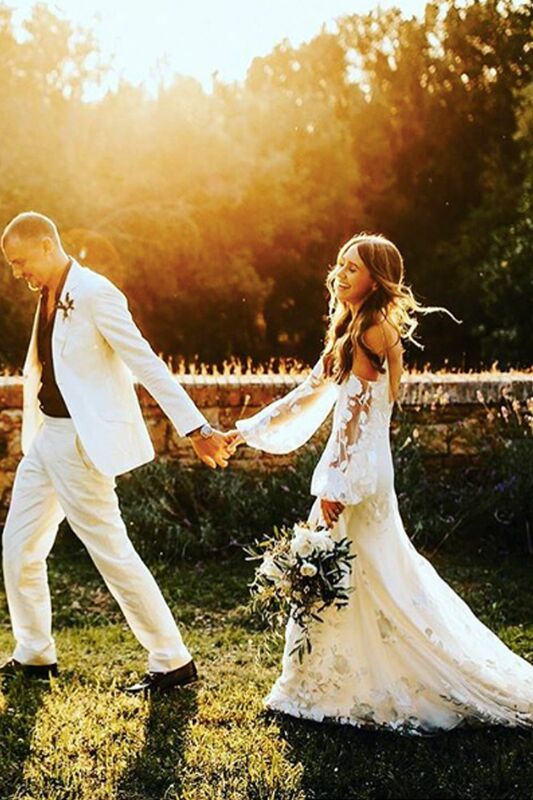 Whether that’s an A-lister or a fashion editor, set in a city or on a beach, there are plenty of stylish brides and grooms we’ve seen over the past few years that we need to tell you about. Our latest crush comes in the form of a German bride, Isa, who we stumbled across on our Instagram travels. We instantly fell for her achingly cool choice of flowy dress and white Ganni jumper, and the simple white bow that secured her bun. Timeless, chic and warm, this look is perfect for any fashion-savvy bride looking to wed in winter. Scroll down to see the full look and prepare to swoon. 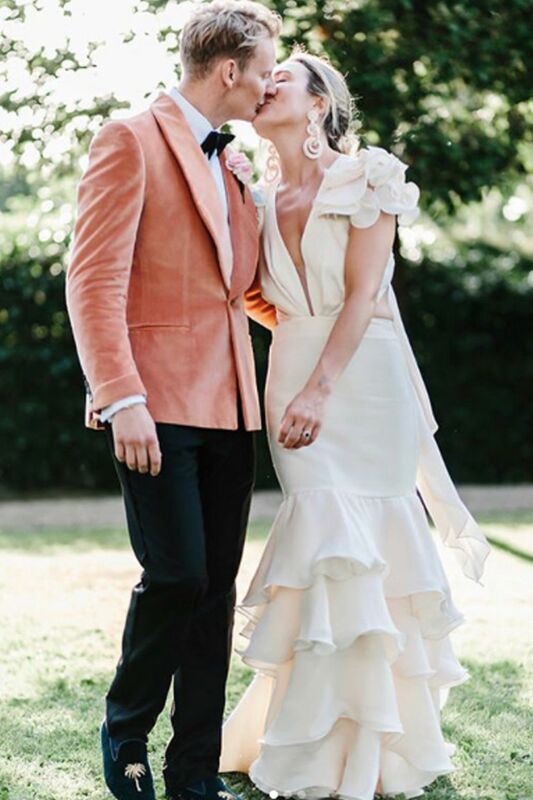 Another major fashion wedding crush comes in the form of super-cool Danish stylist Alex Carl and her now-husband and photographer Jacob John Harmer. 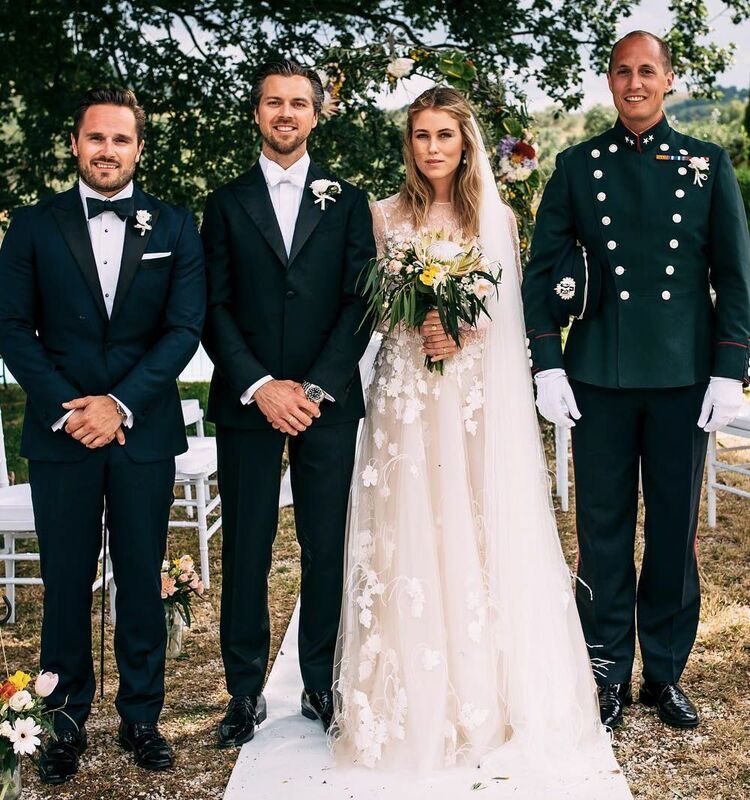 Tying the knot in Denmark and surrounded by the most stylish wedding party we think we’ve ever seen (hey there, Pernille Teisbaek wearing Céline!). Alex and Jacob kicked off their celebrations with a boat party the night prior where everyone was dressed up in white—including the bride in a retro Racil tuxedo. The wedding itself was equally romantic and striking: Alex wore a satin dress and cape from Self-Portrait with custom-made Aligieri earrings and the most gigantic, glorious smile. Congrats, you gorgeous pair! 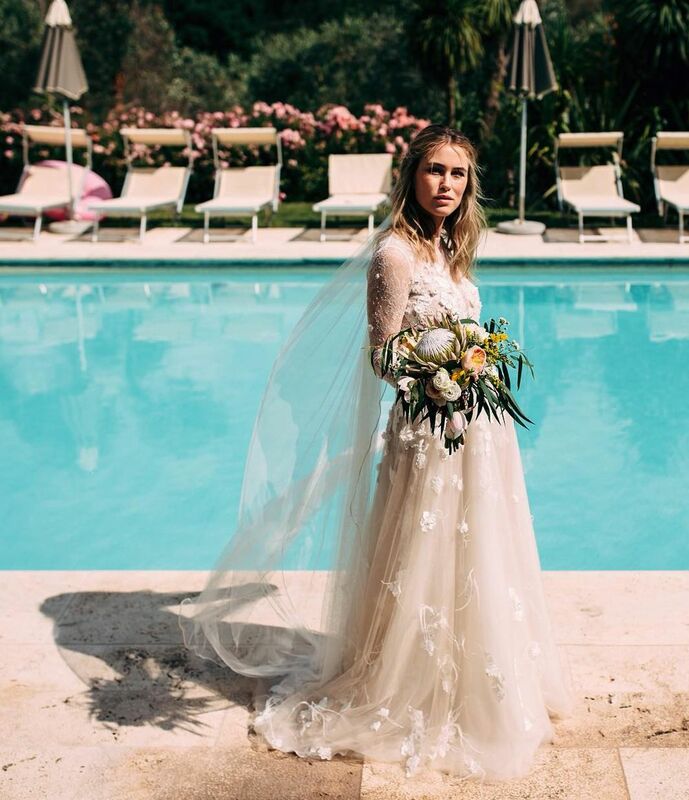 Why it’s so fashion: Scandiinfluencer Annabel Rosendahl and her Otilia Brailoiu lace gown blew us away, as did her rustic flowers, billowing tulle veil and the poolside setting. No wonder Vogue magazine were keen to publish the photos (by Creative Couple Studio) from her big day. Annabel Rosendahl and Petter Ravn Dossland and their wedding party. Why it’s so fashion: With an icon like Kate Moss getting married, it was bound to be a totally fashionable affair. 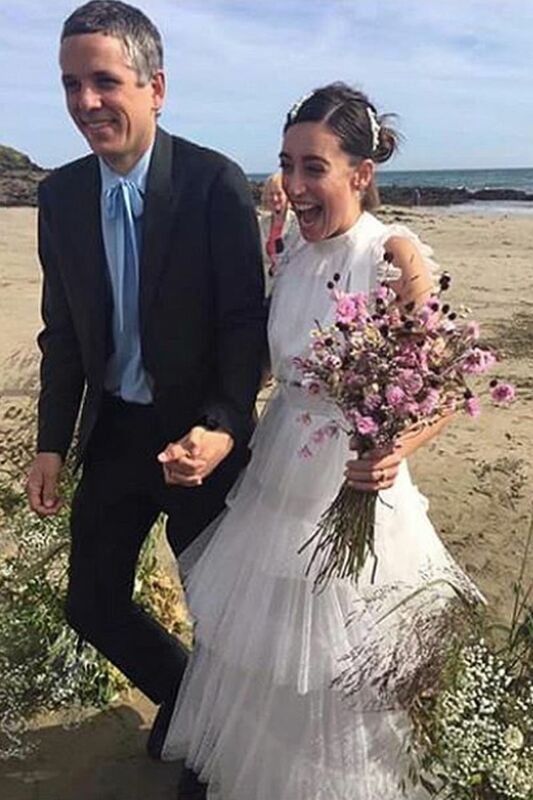 Not only did she get married to The Kills frontman Jamie Hince (marrying a rock ‘n’ roll star is so fashion), guests included the likes of Mario Testino, Naomi Campbell and Sadie Frost. 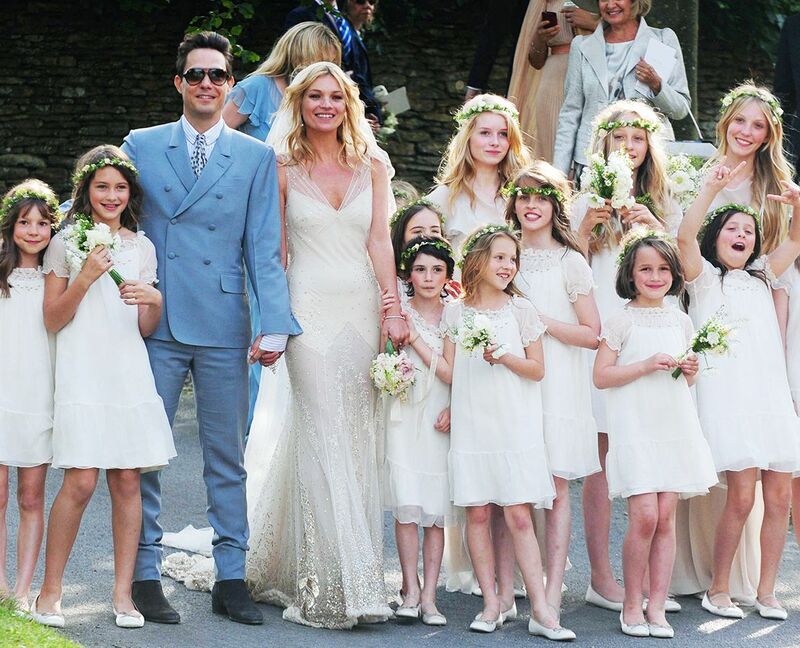 Kate Moss and Jamie Hince with their flower girls. Mario Testino attending Kate Moss and Jamie Hince’s wedding. 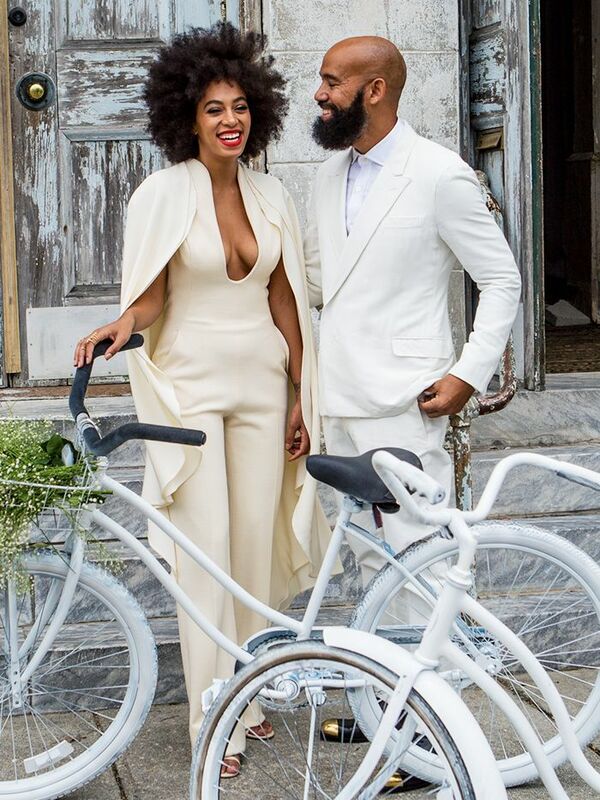 Why it’s so fashion: For the hipster Knowles sister, this wedding required her to have six (!) outfit changes. 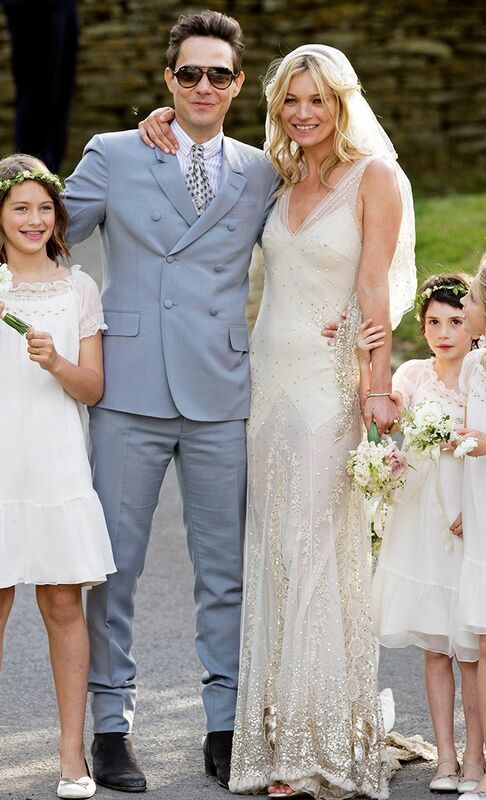 After the ceremony in New Orleans, the bride wore a Stéphane Rolland–designed jumpsuit with a fluttering cape. All her guests were also instructed to wear white. 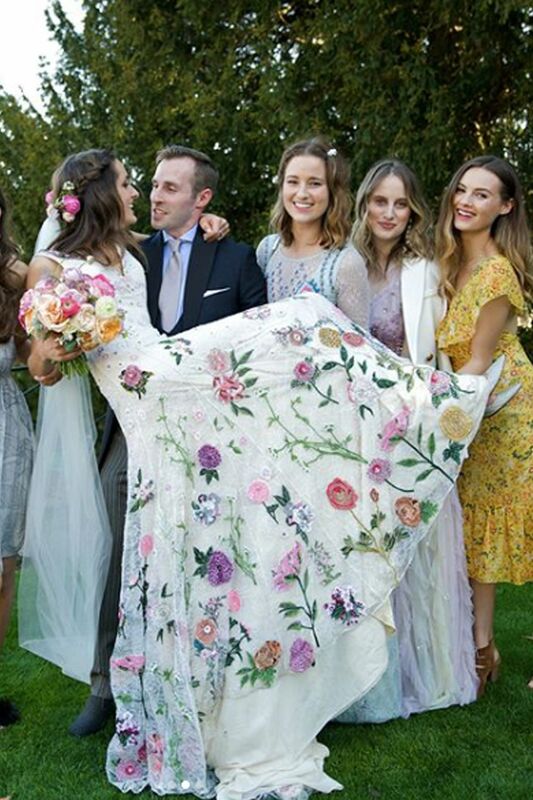 Other than the fact she had the world’s biggest singer attending—her sister, Beyoncé, former J.Crew CEO Jenna Lyons also attended wearing one of the chicest wedding guest outfits we’ve ever seen. Why it’s so fashion: When Amal and George decided to wed in 2014, they went to their beloved Italy to do the deed. However, the Stella McCartney two-piece on Amal for the registry office ceremony was by far one of the chicest bridal looks we’ve ever seen. 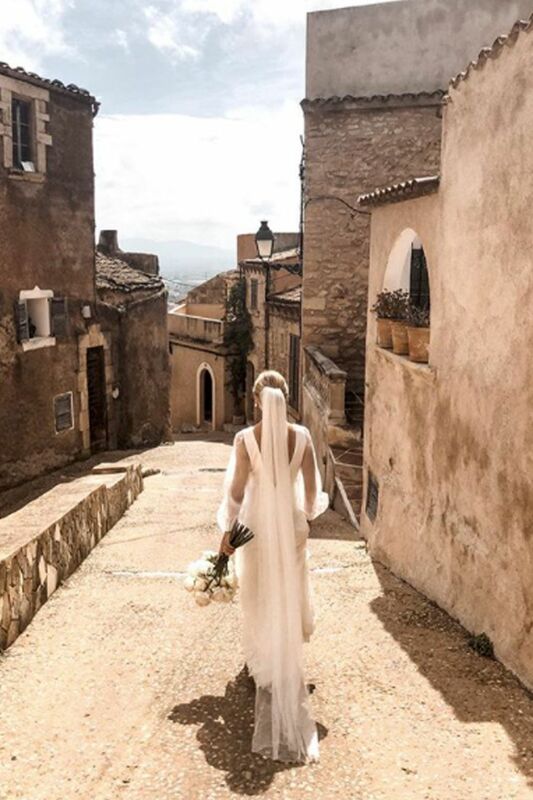 Why it’s so fashion: Before heading to Capri for a full three-day wedding party, Giovanna and her then-fiancé Oscar Englebert got married in a civil ceremony in Stockholm, for which the bride wore a regal Valentino gown. However, it was on Capri where the real fashion show began. For the ceremony, it was Alexander McQueen, plus an Azzedine Alaïa look and another change for a Giambattista Valli outfit in the evening as well. Phew. Why it’s so fashion: Is there anything more fashion than wearing Chanel on your big day? Thanks to Poppy being a muse for Karl Lagerfeld, the model had the chance to wear this Chanel couture creation when she got married in May 2014 in London. Of course, the bride’s sister, supermodel and actress Cara Delevingne, attended as bridesmaid (another fashion point awarded), also dressed in Chanel. Later on that month, the couple had another wedding in Marrakech, for which the bride wore a Peter Dundas–designed gown, with the likes of Alexa Chung on the guest list. Poppy wearing the Peter Dundas gown in Marrakech. 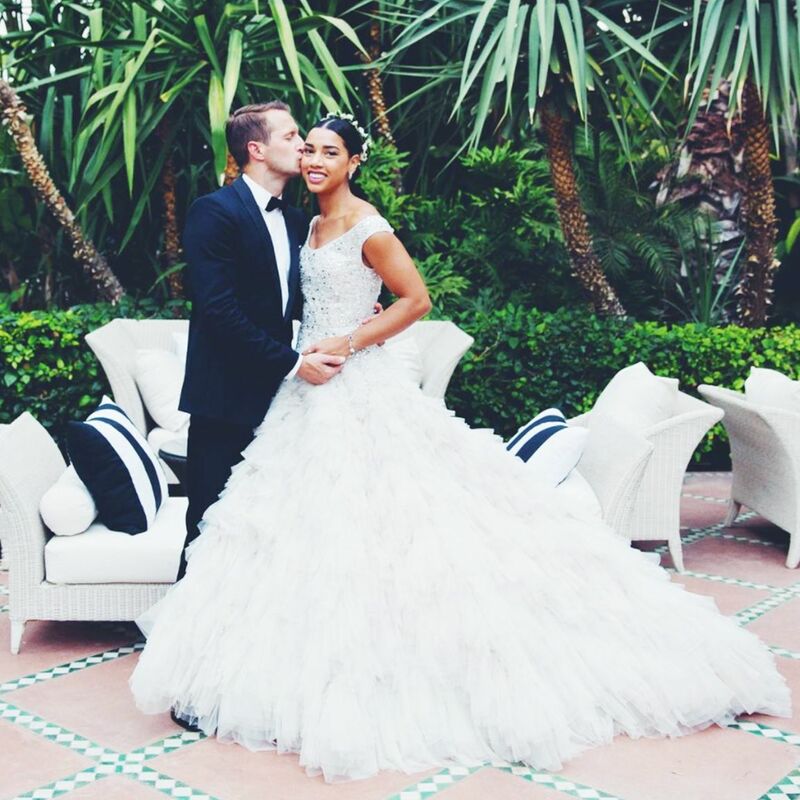 Why it’s so fashion: During a four-day event, the New York–based couple got married earlier in 2017 in Morocco. As per the usual for a fashion wedding, there was an outfit for the actual ceremony and also the evening. Here, Hannah wears her nighttime outfit that was a creation by Elie Saab, but for the ceremony, she went for Vera Wang. Why it’s so fashion: While Whitney kept it simple in terms of outfit changes, the biggest thing about her look in terms of fashion is that she went for such an unusual hemline. Instead of playing it safe and going for something long, she maximised one of her best assets (her legs) and went for a dramatic waterfall hemline gown by Ashi Studio. Why it’s so fashion: The ultimate way to do an elegant wedding is to casually announce you just got married. That’s exactly what OP and Johannes Huebl did when they got married in 2014. Olivia bucked the trend of wearing a dress, opting for a Carolina Herrera top and skirt, and finished it off with blue Manolo Blahnik shoes. Why it’s so fashion: There’s something so cute about the model’s dress. Created by upcoming fashion designer Molly Goddard, the frothy tulle made for a seriously pretty (but totally on-trend) wedding dress. The bold shock of turquoise on her feet just gave it that finishing touch. 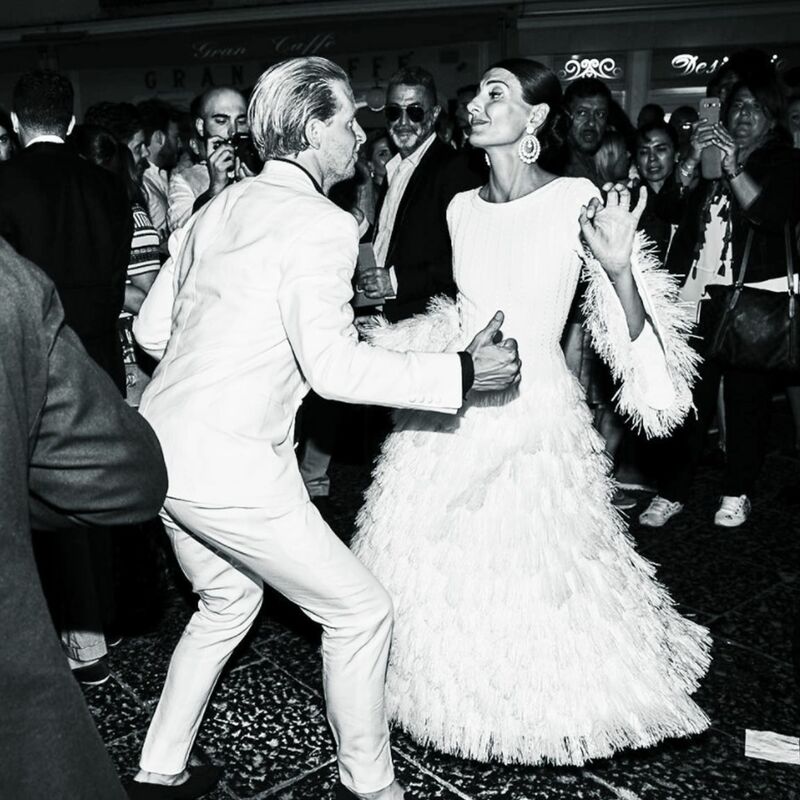 Why it’s so fashion: Other than the fact she’s an international model marrying a fellow model, this was the kind of achingly cool wedding that looked like so much fun. The nuptials, which took place in New York last year, were predictably full of other models and notable people from the fashion industry. Designer Alexander Wang even took this video of Hanne strutting her stuff down the aisle as if she was walking a runway—#sofashion. Why it’s so fashion: Allison Williams has been the darling of the fashion world ever since she became a major name, thanks to her part as Marnie in Girls. So it was no surprise that her wedding gown was breathtaking. 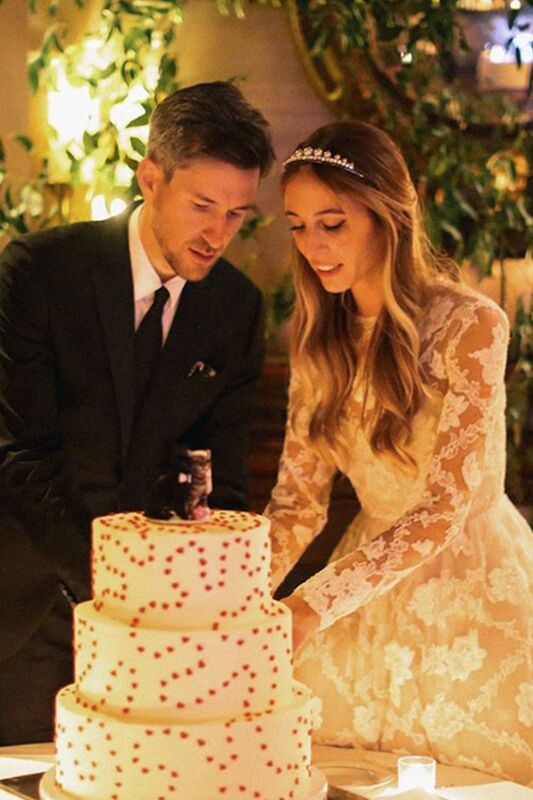 While she’s been spotted wearing Giambattista Valli and Valentino creations on the red carpet, it was this Oscar de la Renta gown that made the cut for her big day in 2015. Why it’s so fashion: For a something blue, Hannah Weiland aka Shrimps (her nickname inspired moniker for her cult, London label) made herself a blue version of the beaded lady bag that has inspired a million rip-off this season. Marrying an heir to the brewing dynasty, it was only right that guests sipped on the black stuff served from a pop-up pub called Arthur’s Arms. A hip crowd including family and stylish friends played pétanque and danced the night away in a glittering marquee. 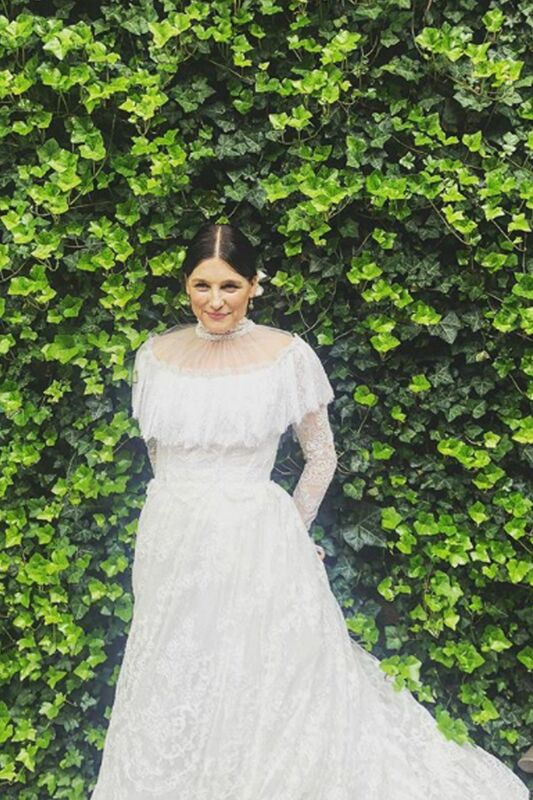 Why it’s so fashion: Shoe designer and uber-stylist Tabitha Simmons’s wedding was never going to be short of inspiring. Having swapped Britain for NYC, this talented image-maker wore a gown from Dolce & Gabbana’s Alta Mood atelier, having closely collaborated with the duo for over a decade. Guests at the Upper East Side nuptials included a host of fashion heavyweights, such as designer Tory Burch, model Karen Elson, fellow stylist Kate Grand, Lauren Santo Domingo and actress Liv Tyler. Why it’s so fashion: London-based digital strategist Rosanna Falconer counts her former boss, Matthew Williamson, as one of her close friends. So it was only natural that she choose to wear one of the designer’s heavily embroidered creations to say “I do” to George Ryan. 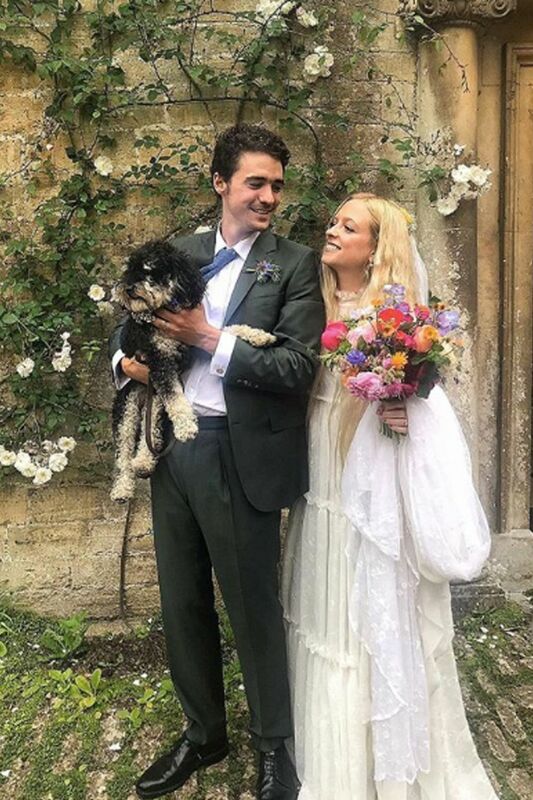 The fairytale theme continued with a life-size unicorn that made for perfect Instagram fodder, not forgetting the beautiful setting of the Cotswolds and a sprinkling of photogenic friends. A closer look at the exquisite embroidery on the new Mrs Ryan’s Matthew Williamson gown. 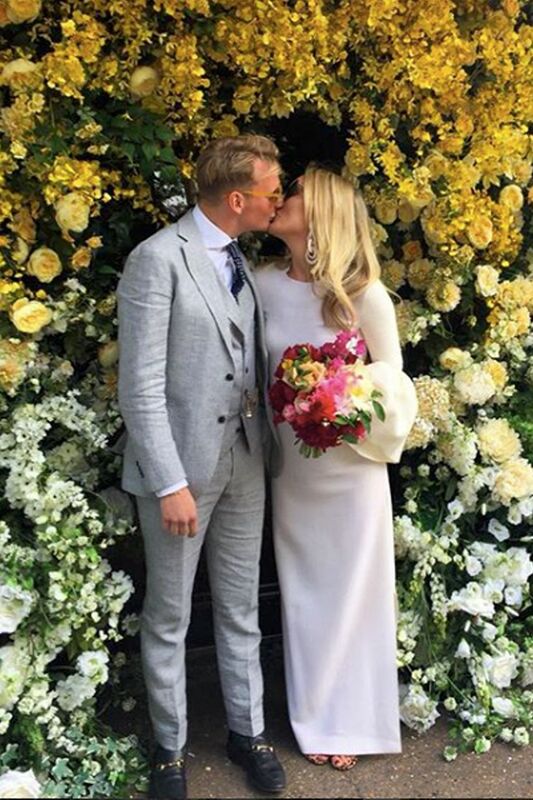 Why it’s so fashion: Interior designer Lucy Barlow enjoyed not one but two fabulous ceremonies—and thus two equally photo-worthy frocks. Roksanda Ilincic’s Margot dress provided the voluminous bell sleeves to make her and Joshua Sear official at Chelsea Town Hall in May 2018. Why it’s so fashion: The face of Balenciaga, Danish actress and model Emma Leth’s bridal look was bound to push boundaries. 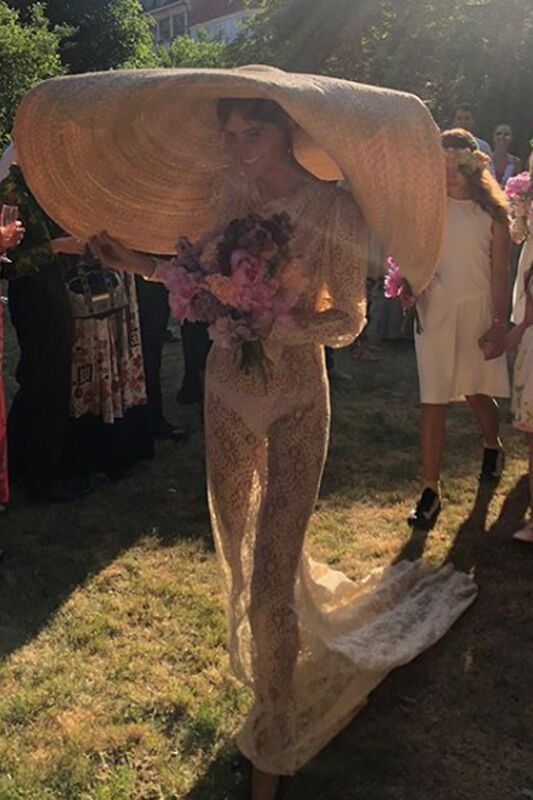 True to form, she delivered in a sheer, lace dress that revealed lilac underwear and an enormous hat by French designer Jacquemus. Bohemia at its most real. 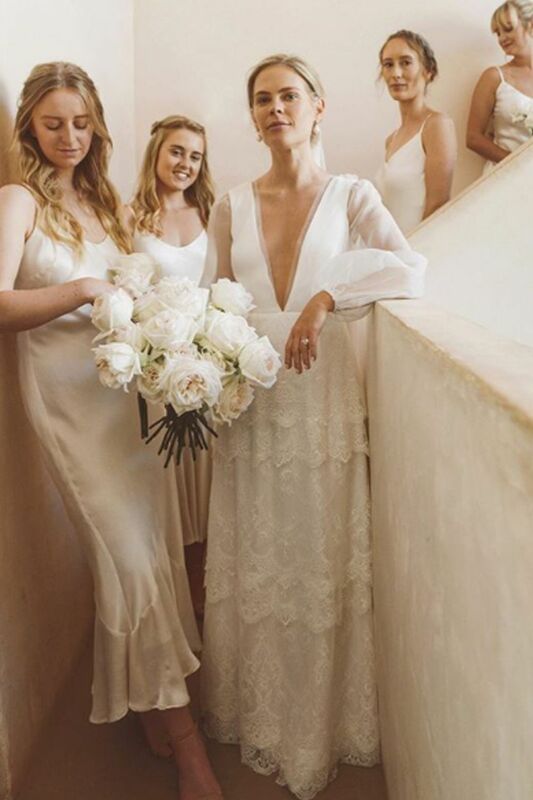 Why it’s so fashion: With over 300,000 followers on Instagram, blogger Jessie Bush’s wedding was always going to been to swoon over. 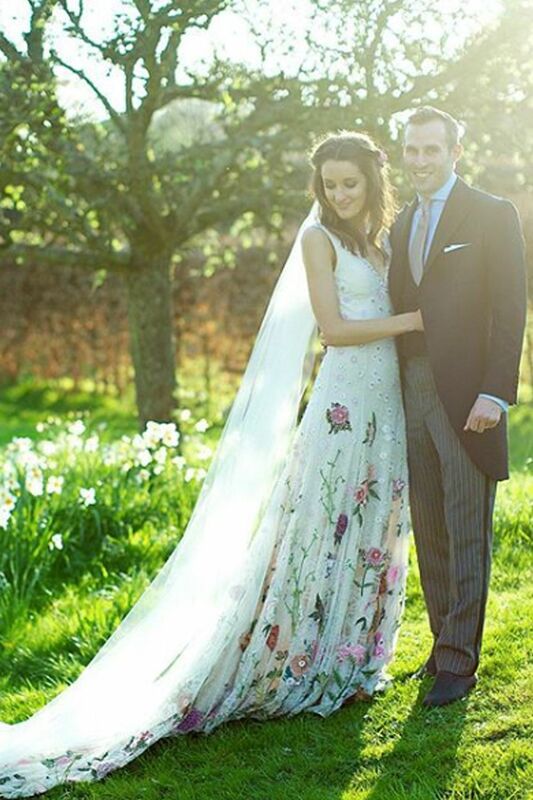 Dubbed #amallorcan affair, the bride wore a custom-made, tiered gown by go-to London bridal designer, Charlie Brear. Bush’s bridesmaids complemented her look perfectly in Ghost bridesmaids dresses. 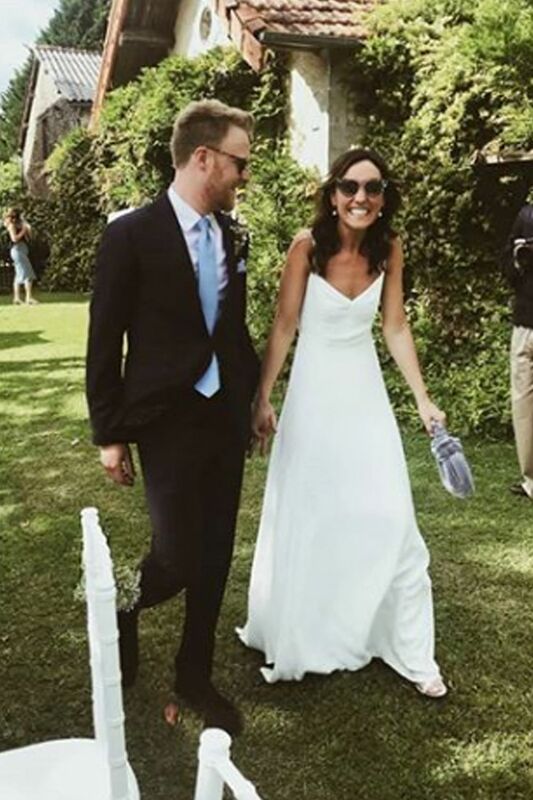 Why it’s so fashion: Former fashion PR manager Gemma was beaming from head to toe when she wed recently in Tuscany. 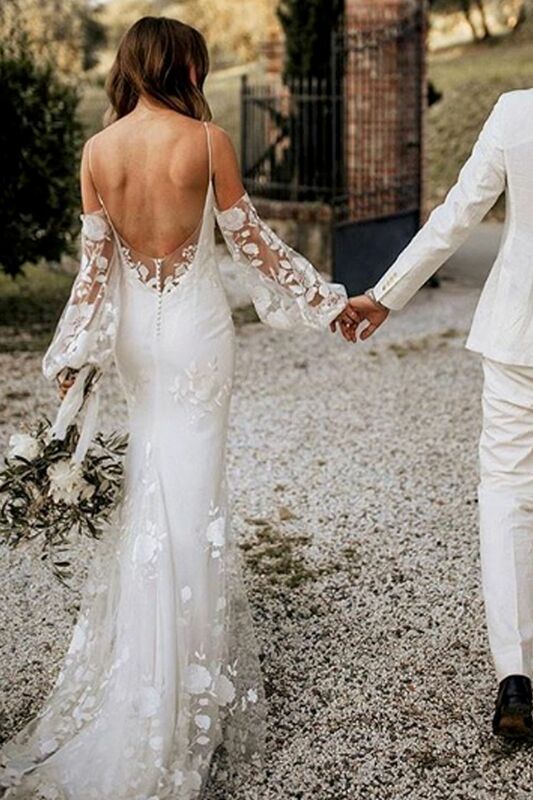 Sheer lace sleeves topped off her dreamy gown by Parisian label Rime Arodaky. Another angle of that stunning white gown. Why it’s so fashion: If you’re dreaming of an haute couture gown look away now – Mrs Schwartzman had three. Yes, three! She married fellow DJ Ross Schwartzman in New York City and called upon Valentino to design three unforgettable gowns, including this full-length dream with a lie overlay. 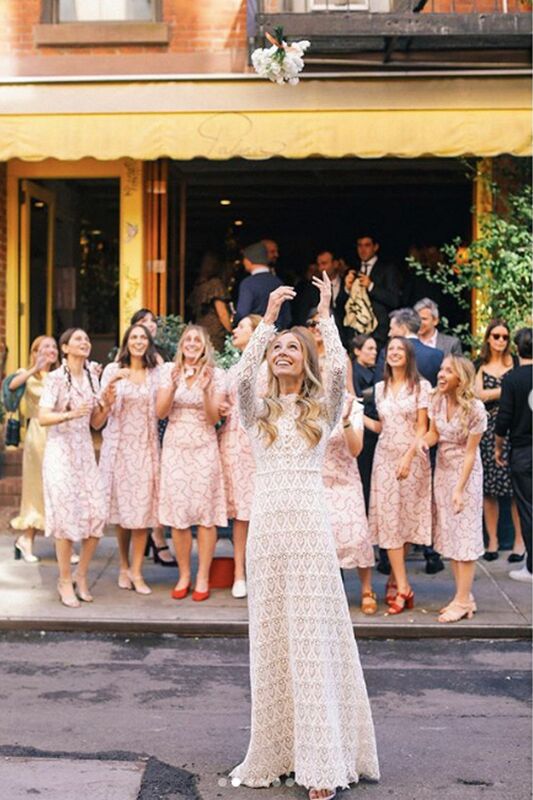 Another beautiful Valentino and 10 bridesmaids clamouring to catch her bouquet wearing matching String of Heart–print dresses from her fashion line, HVN. Why it’s so fashion: TV presenter and fashion plate Laura Jackson collaborated with friend and respected designer, Rejina Pyo, for her memorable, tulle-heavy gown. She also called in pearl-embellished hair slides from Simone Rocha that were hot off the catwalk. That’s fashion, folks. Why it’s so fashion: Knowing your style is the key to defining your own personal look, so when Stylist magazine’s executive fashion director Kitty McGee wore two effortlessly simple but stunning dresses to tie the knot in, we weren’t the least bit surprised. Free of any fuss and frills, this Reformation gown provided more than enough pomp for her memorable French ceremony.